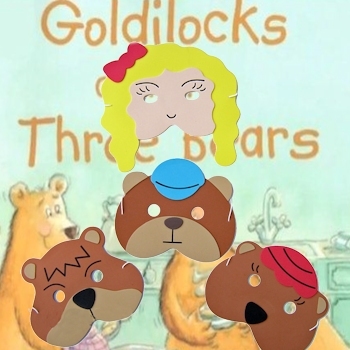 Fun Gift Set storytelling play masks of classic fairy tale of Goldilocks and the three bears that children will love to act out as. These masks are a favourite with children, child-minders and teachers -aiding imaginitive play and storytelling. This 4 piece Fairy Tale Mask Set includes: Goldilocks mask, Papa Bear, Mama Bear and Baby Bear.